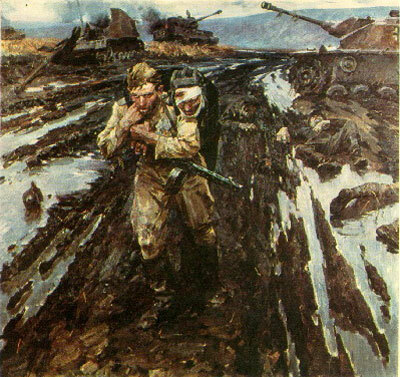 The Battle of Stalingrad, August 23, 1942 to February 2, 1943, between the one million man German army and the million and a half man Soviet army was the largest armed confrontation in world history. At a cost of half a million dead and many more wounded, the Soviets defeated the Germans, who lost an entire army and some twenty squadrons of air-craft. The reputation of Nazi invincibility had been broken, sixteen months prior to D-Day (June 1944,) the Allies’ victory in North Africa by four months, and that of the armistice with Mussolini’s Italy by six months. Despite at least six movies with the title “Stalingrad,” and dozens more making use of the standard war-tropes of brave men, cunning fighters, ruthless struggle, most Americans know little about the battle, or its crippling of the German army. Those who know are likely those for whom big battles, big guns, tactics, strategy and military “things” are the trail markers for their lives. Authors write about Hitler’s interference with his brilliant generals; tactics and strategy are hashed out and re-played in war-games; schematics and action photos of weapons of war are sought and appreciated. “What kind of gypsy camp its this?” The general pointed to a farmyard ringed in by a wall of vehicles–peasant carts, sledges, truck. Even the entrance was blocked by ambulances and masses of soldiers with bandaged heads and stumps of limbs wrapped in rags. Plievier was a German radical and writer who fled to the Soviet Union in 1934 after his earlier books about WWI, The Kaiser’s Coolies (1929) (my review here,) and The Kaiser Goes, the Generals Remain (1932), had been banned and publicly burned during Hitler’s rise to power. He continued to write left-wing political commentary and short fiction in Moscow and was evacuated with other foreign writers and artists to Tashkent as Operation Barbarossa began on June 22, 1941, breaking the 1939 non-aggression pact with the invasion the Soviet Union. With the defeat of the German army a year and a half later, February 2, 1943, the NKVD gave Plievier wide access to interview German POWs, from which the material of Stalingrad was drawn. Although many men, from privates in a disciplinary battalion to the leading officers of the army, are introduced and followed, the normal interest in, and tracking of, characters in a novel is overwhelmed by the scenes in which they appear. The opening page of two men digging graves in the frozen ground tells us what is ahead. Those with a mind for battle tactics will find a fairly thorough accounting of those 164 days; for those interested but not schooled in maneuver and deployment, the lack of maps will be a major impediment to being able to follow the action. Even with battle maps available on-line, since the place-names on map and in the novel are not easily matched, the advances, retreats and references to places fought over earlier become part of the atmospheric background rather than anchors to the plot. The Germans were ordered to stand-fast by Hitler after the Red Army regrouped following the loss of Stalingrad and attacked in force and with great ferocity. As the novel opens the men of interest are caught with essentially the whole German army in a pocket between the Volga, on whose eastern banks stood Stalingrad, and the Don River further to the west. The German high-command, on the ground had recommended a full-scale assault to break through the Soviet cordon and, by uniting with another promised army, to recapture the city; Hitler refused and so the million plus men withered away, starved, frozen and blown apart. “There were generals whose faces turned purple with rage when they read this reply. There were staff officers whose faces became rigid masks as they received and transmitted orders. There were fits of fury, hoarsely shouting voices, obstinate silences, injections of morphine and veronal, lapses into deathlike prostration. And there was obedience, criminal, murderous obedience…. “Here was the scene of the lost battle, of the lost war, of the zenith of German power and the most crushing defeat in German military history. Here the German people had fallen to the lowest point, politically and morally, in their history. Where the need of the hour had been courageous defiance of the rulers, four and twenty general had clicked their heels as one man; where revolt should have flared up among the masses of soldiers, there had been nothing but physical and spiritual dissolution, apathy, a dumb dying without even a curse on their lips. “Urbas … was no longer that Sergeant Urbas who could pass unmoved by gallows from which hanged men and women dangled and who could drive without a second thought past anti-tank ditches that he knew were filled with the bodies of executed civilians and prisoners of war. The Urbas in the dugout was a desperate, dying man and he howled and shrieked; sweat dripped from his face and he foamed at the mouth. Some have characterized Stalingrad as an anti-war novel, and it is difficult to understand how the never-ending scenes of carnage, suffering, and despair can be read as anything but an encyclopedia of reasons not to fight such wars –though I’m sure some will. It is, overwhelmingly, an encyclopedia of those who fought; only a few pages mention civilian relations of some of the soldiers. Nowhere is an account of Stalingrad’s population, which also died in the hundreds of thousands. … and a last-page walk-off for Vilshofen and the discipline-battalion private as if towards a future of comradeship and joint, redemptive effort. Plievier followed Stalingrad with two other, city-denominated titles: Moscow,(1953,) about the earlier German siege of Moscow ( October 2, 1941 to January 7, 1942 ), the ferocity of which, and losses suffered on both sides, presaged Stalingrad. Of the three docu-novels, it has been judged the poorest. Berlin (1956) was the last of the trilogy, and about the last days of the war, as the Red Army closed in on Berlin. As with the others, Plievier depended on many interviews and his own historical fidelity to create the novel. It was written after he had announced his separation from the Soviet Union in 1948; the Red Army is portrayed as ruthless: murderers and rapists on a grand scale. Though I haven’t read other than Stalingrad, from summaries and reviews, it seems that Plievier, by no means a pacifist, roared in all three novels, equally, at the armies, the officers and men, their political overlords, for behaviors of omission and commission, for stupidity, lust and cruelty, for which war itself, not particular wars or deeply held beliefs, is an open opportunity. Many other books have been written about this little-appreciated turning point in the war against Fascism. A novel of considerably less length, but quite well thought of is Gert Ledig’s The Stalin Front, (1955) available in a 2004 translation by Michael Hoffman. Among history books, Antony Beevor’s Stalingrad: The Fateful Siege, 1942–1943(1998) is often mentioned in the first rank. There are many others, almost entirely organized around military, rather than societal, interest. Col David Glantz (Ret) outdoes everyone with four volumes on the military specifics. And here is a list that will keep one reading for years — none that I have seen with a focus on the civilian consequences. Of the many films that have been made of this battle, most of them promising “super battle action, ” great scenes,” “epic battle, ” one in fact was created from Plievier’s Stalingrad, in 1963. I do not find, however, any source to see it.